Looking for new ways to engage with your YouTube subscribers? Have you heard of the YouTube Community tab? The Community tab allows creators to post updates, create polls, share GIFs, and interact with subscribers and visitors. 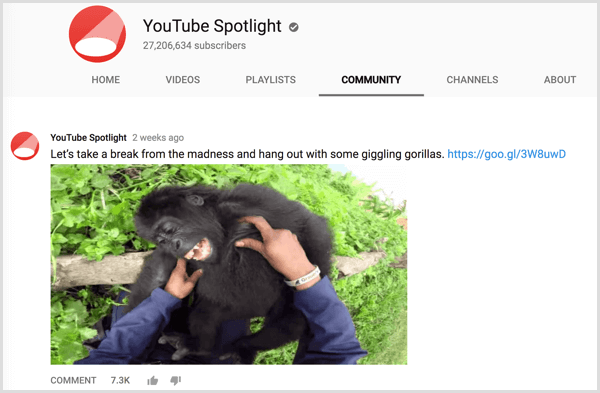 In this article, you’ll find out how to use the YouTube channel Community tab to engage with subscribers, inspire new content, and promote your business. 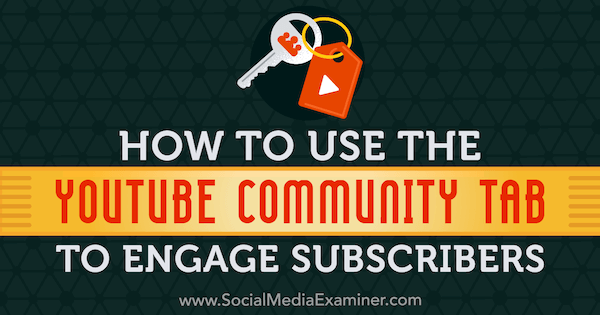 How to Use the YouTube Community Tab to Engage Subscribers by Kristi Hines on Social Media Examiner. The Community tab replaces the Discussion tab, which has been an optional discussion area for YouTube channels. 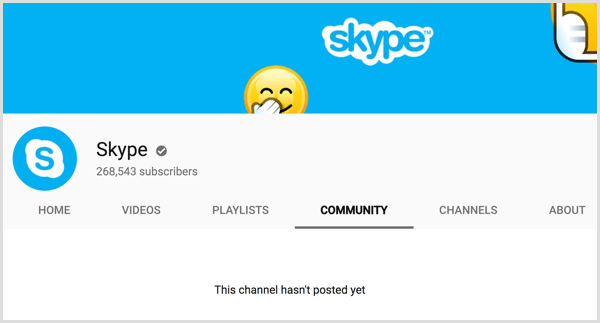 To find out if you have the new Community tab, visit your channel and look below your channel art. If you have the Community tab, you’ll see it in place of the Discussion tab. The primary difference between the new Community tab and the old Discussion tab is the posting capabilities. The Discussion tab allowed creators, subscribers, and visitors to post only text-based status updates and replies based on the channel’s Discussion settings. The Community tab gives channels a Facebook page-like experience where creators can post various types of status updates – text, images, links, and GIFs. Subscribers and visitors to the channel can like posts and reply (text only). 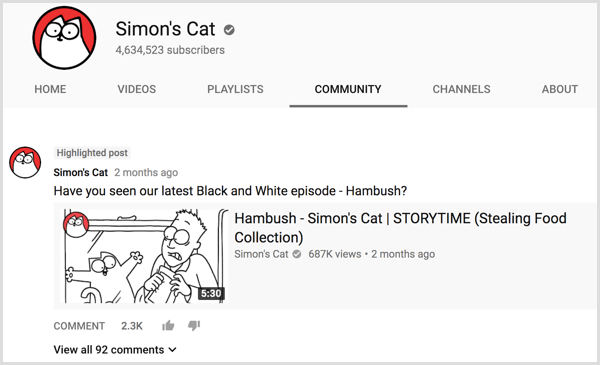 The Community tab is rolling out first to select YouTube channels (both verified and non-verified) with over 10,000 subscribers. As with most social networks, the feature will likely roll out to larger brands, advertisers, and active YouTube creators first and then roll out to everyone else. 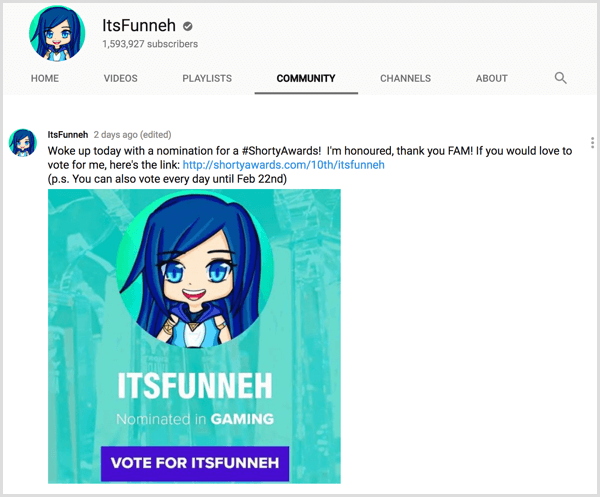 To get inspiration for your own community posts, follow the community posts of channels you subscribe to by visiting their Community tab or by viewing the Subscriptions tab of the YouTube app. Once you have access to the new YouTube channel Community tab, you can use it to reach audiences in the following ways. Note that the “highlighted” posts in the examples are community posts accessed by clicking the post’s timestamp. They’re not posts that were highlighted by the YouTube creator. 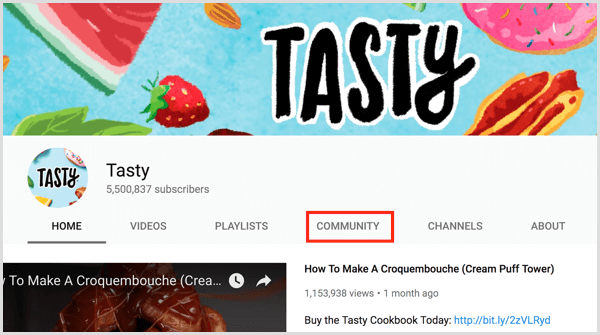 Because YouTube subscribers and visitors expect video from your channel, it might be best to introduce your channel’s Community tab with a video. To add a link to your Community tab in the video description, open the tab and copy the URL from your browser’s address bar. 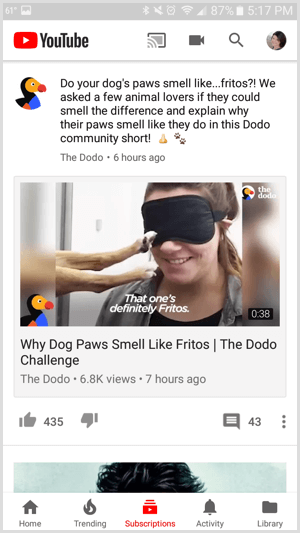 Share the video on your Community tab to ensure first-time visitors to this tab know what they can do to engage with your channel. In addition to helping your YouTube audience get to know your Community tab, use a video or a community post (or both) to let subscribers know how to get notified about your latest channel activity. Explain that they need to click the bell icon to the right of the button they use to subscribe. The first post on your Community tab is the perfect place to welcome your YouTube audience and let them know your intentions. YouTube suggests creating a creed as a way to build a strong community via this tab. 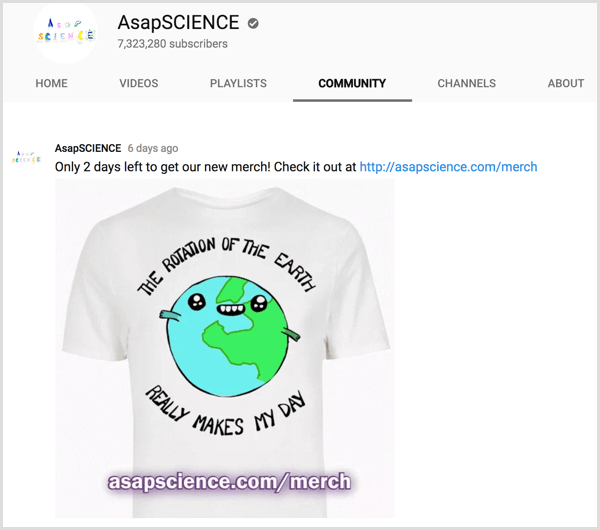 You can market products to channel subscribers and visitors on the Community tab. Post a status update to the tab with an image of your product and a link to the product’s sales page. Consider creating a special landing page on your website for your channel subscribers and offer an exclusive discount just for YouTube visitors to measure the results. Just posted a new YouTube video to your channel? Promote it by sharing a link to the video on your Community tab. YouTube will add the thumbnail image, title, number of views, and age of your video to the update as a part of the link preview. 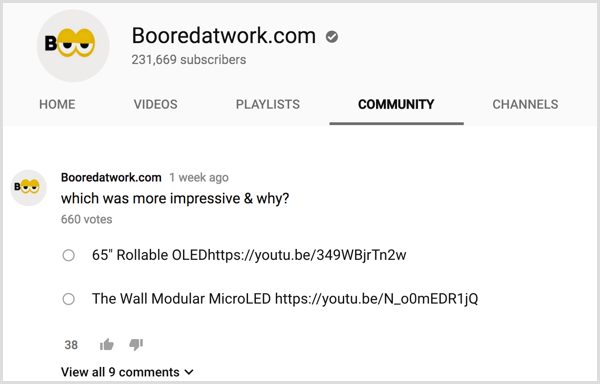 Another way to promote a video on your Community tab is to give subscribers a sneak peek or teaser that piques their interest and makes them want to click through to your video link. 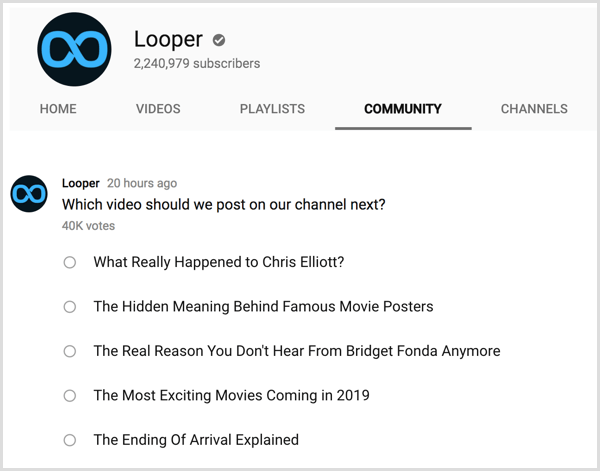 Each video on your channel should give lots of sneak peek and teaser options for multiple community posts. Don’t forget to promote past popular videos to new audiences too! Does your video talk about two or more things or ideas? Find out what your subscribers and visitors like most about it by posting a poll on your Community tab. Engage with channel subscribers and visitors by hosting a Q&A on your Community tab. If you plan to answer questions for a set length of time, promote the Q&A in advance on your Community tab to maximize participation. You can also leave the Q&A open by answering as many questions as you receive, based on your channel’s popularity. Another great way to use polls on your Community tab is to find out what your subscribers and channel visitors want to see next. Use polls to gauge interest in general and in specific topics for your upcoming YouTube videos. Most audiences have specific GIFs and memes they can relate to. 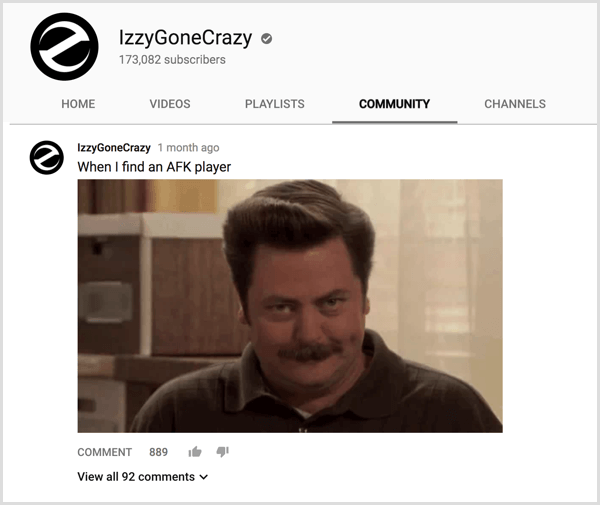 You can now share those images as community posts to further entertain channel subscribers. Do you need support from your YouTube audience? Use a community post to direct your subscribers’ attention toward a particular topic or prompt them to complete a specific task such as helping you win an industry-specific award by voting. 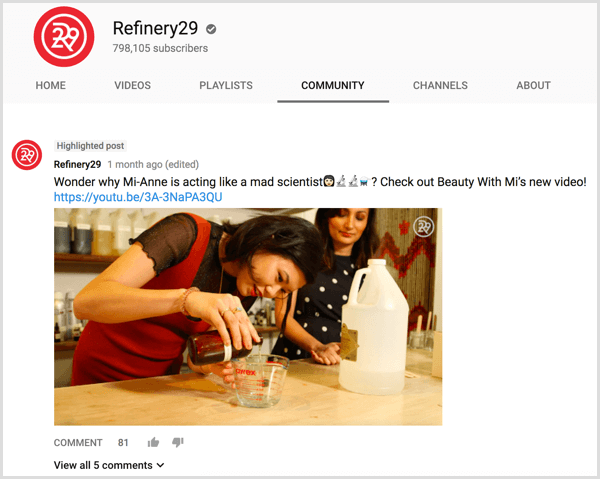 YouTube’s Community tab allows creators to engage with their channel subscribers and visitors beyond just video. Use this tab like you would your Facebook page wall: post status updates, ask questions, encourage visitors to ask questions, poll your fans, and much more. What do you think? Do you have access to the Community tab on your YouTube channel? How do you plan to use it? Let us know what you think about it in the comments!